Home > Publications > Financing the Energy Transition: Are World Bank, IFC, and ADB Energy Supply Investments Supporting a Low-Carbon Future? Finance provided and catalyzed by multilateral development banks (MDBs) will help pay for implementation of the UN Sustainable Development Goals and the Paris Climate Agreement in many developing countries. Although MDBs already track and report on their climate finance, less is known about how investments across their entire energy supply portfolios relate to achieving sustainable development and climate-change objectives. This paper provides a first-cut assessment of how the energy supply investments of the World Bank, International Finance Corporation (IFC), and Asian Development Bank (ADB) align with the Paris Agreement goal to limit global temperature rise to well below 2°C. Finance provided and catalyzed by multilateral development banks (MDBs) will help pay for implementation of the UN Sustainable Development Goals and the Paris Climate Agreement in many developing countries. Although MDBs already track and report on their climate finance, less is known about how investments across their entire energy supply portfolios relate to achieving sustainable development and climate-change objectives. This paper provides a first-cut assessment of how the energy supply investments of the World Bank, International Finance Corporation (IFC), and Asian Development Bank (ADB) align with the Paris Agreement goal to limit global temperature rise to well below 2°C. The majority of projects considered in our analysis are 2°C-aligned or could be aligned under the right conditions; getting the conditions right will be key to achieving a low-carbon future. Our analysis raises important policy questions for MDB shareholders, including the Group of Seven (G7), and for MDB management. These include how best to promote the deployment of technologies that are unambiguously aligned with 2°C scenarios, how to put in place the conditions that foster alignment with such scenarios, whether and how to deploy energy-supply technologies that remain controversial, and how to manage the risk of technologies that lock in high carbon energy generation for long time periods. The World Bank, IFC, and ADB support a range of technology options—including but not limited to “aligned” technologies—to help countries supply energy to their populations in a manner that is consistent with 2°C pathways. Conditional technologies account for the largest share of energy supply investments by project number and volume of finance. This is not, in itself, problematic. The IPCC notes that no single option is sufficient to reduce CO2-equivalent concentrations and eventually eliminate net CO2 emissions (IPCC 2014). Technologies categorized as conditional have a significant role to play in the low-carbon transition, but only if they are designed and implemented properly and with the right strategies and policies in place to ensure that they fit with NDCs and enhance countries’ ability to ramp up their ambitions over time. This is particularly relevant for MDBs as they work with their clients to explore the full range of possibilities to achieve sustainable growth and poverty reduction (see figure). Investments in electricity transmission and distribution (T&D), vital to a low-carbon future, account for the highest share of the World Bank and ADB’s recent and approved financing for energy supply, around half of the volume of financing and about 40 percent of the number of projects in both banks. Well-functioning and managed T&D systems are needed to bring renewables onto the grid and increase efficiency in both the delivery and end use of energy (i.e., through smart-grid technologies) (IPCC 2014). Investments in these areas, while “conditional” according to the framework, are necessary to achieve low-carbon growth and could reap benefits down the road if energy systems incorporate a greater proportion of renewable energy and increased energy efficiency. Investments in T&D provide a good illustration of how conditional projects may in fact be well aligned with 2-degree pathways; in this case, the “conditional” categorization serves more as a reminder of the urgent need to decarbonize the electricity grid as it expands and becomes more efficient. Across these MDBs, there were fewer natural gas power generation projects than renewables projects, and natural gas power-generation had a lower overall associated volume of finance compared to the total for all renewables. However, if project pipelines evolve to include more natural gas generation projects, care will be needed to ensure that this “bridge” fuel does not lock out renewables. Switching from coal to natural gas presents significant emission reduction opportunities, particularly in fast growing economies with coal-based power generation, since natural gas is the cleanest burning fossil fuel. Natural gas is also attractive because it can play a grid stabilizing role with variable renewables. But for natural gas to truly play a bridging role, guardrails will need to be in place, for example, by ensuring that natural gas displaces coal generation (rather than merely adding to it) and supporting other measures like carbon pricing, methane regulations, and renewable portfolio standards (Lazarus et al. 2015). There were 21 oil and gas production projects (mostly involving natural gas) across all three MDBs in our review—the only controversial project types that have both high associated emissions and high lock-in risk. These upstream investments raise concerns about lock-in risk and stranded assets (Carbon Tracker Initiative and Grantham Research Institute 2013). Recent research estimates that a third of all oil reserves and half of all gas reserves should remain unused through 2050 in order to stay under the 2°C threshold (McGlade and Ekins 2015). This would imply that investment in exploration, development, and extraction of new sources of oil and gas could move from the “controversial” category to “misaligned” in a future refinement of the methodology. Large hydropower projects were the second most prevalent among the controversial project types (following oil and gas production). Several of the large hydropower projects involved refurbishing existing plants rather than constructing new ones. The misaligned projects that we identified usually had a strong development rationale outlined in the project documents, but the high lock-in risk associated with fossil fuel generation raises concerns about the ability to limit temperature rise to well below 2°C. In some cases, these projects may present a lower-carbon energy option than the current status quo, for example, individual coal stoves or diesel generators, and so there is an incremental improvement from a GHG emissions perspective. However, the urgency of the climate change challenge demands that MDBs consistently seek transformational and innovative approaches to meeting development needs. 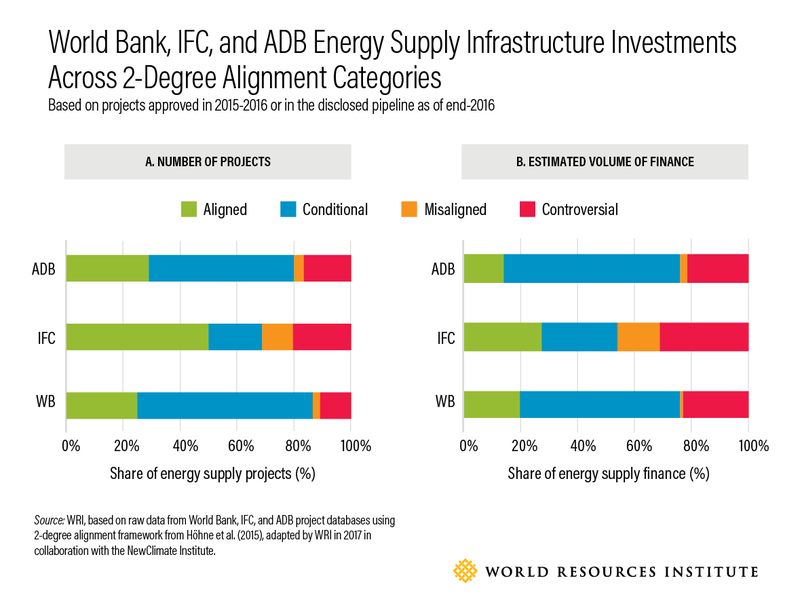 We were limited in our alignment analysis by the fact that we were only able to clearly assess 2-degree alignment for direct investments in infrastructure, and not policy lending, technical assistance/capacity-building projects, or indirect financing. Nevertheless, we did review policy loans and technical assistance/capacity building projects and found that a significant portion of this programming appears to go to support cleaner energy, but some investments still warrant further consideration. All three of these MDBs also lend indirectly via financial institutions and funds. Current reporting and disclosure practices make it difficult to understand and assess the alignment of MDBs’ indirect finance for energy supply investments. Aligning the conditional. MDBs have an opportunity not only to pursue aligned projects and avoid misaligned ones, but also to establish the right conditions, project characteristics, and strategies for ensuring that all energy supply investments accelerate the transition to a low-carbon future. Going beyond solar. As certain technologies mature (like solar photovoltaic (PV), where the World Bank, IFC, and ADB are currently most active among “aligned” technologies), MDBs should consider gradually shifting into newer technologies, like battery storage, to build new markets and avoid crowding out the private sector. Coordinating public and private-sector arms. Lining up complementary support at the right points in the project or market development cycle could be a way to amplify impact. This can be done by getting public and private MDB arms to work together better. An example is the World Bank Group’s Scaling Solar Initiative under which the World Bank supports governments with plans to develop solar PV and integrate it into the grid, while the IFC offers a set of bankable documents (for example, power purchase agreements (PPAs)) and preapproved financing, speeding up the development process and reducing uncertainty (World Bank Group 2017). Crossing the gas bridge. If MDBs continue to build out and increase natural gas power generation capacity, they should work with their clients to anticipate the transition out of gas to zero carbon alternatives, make deep gains in energy efficiency, and/or have a plan to incorporate CCS. This will be necessary to make the bridge real. Thinking twice about fossil fuel production. Development finance for fossil fuel production can effectively serve as a type of fossil fuel subsidy (Bast et al. 2015). G7 leaders—major MDB shareholders—have committed to phase out inefficient fossil fuel subsidies by 2025 (G7 2016). The G7 should review MDB support for fossil fuel production in light of these commitments. Exploring more refined approaches to existing large hydropower. As existing large hydropower plants age, questions about refurbishment will continue to arise. A better understanding of the available options, alternatives, and impacts will be helpful to determine whether these investments could be less controversial than installing new generation capacity. Avoiding any misalignment and overcompensating for exceptions. Given the MDBs’ commitments to help address the climate-change challenge, continued investments in fossil fuel generation should only occur while ramping up investments in fuel switching (to renewables), energy efficiency, and/or CCS technologies to minimize the climate impacts of misaligned projects. This will leave room for exceptions that meet particularly acute energy access challenges for which countries request financing for fossil fuel generation projects, particularly if these countries are very low emitters with low projected growth in energy demand. Shining a light in dark corners. To fully understand the alignment of MDBs’ activities, it will be necessary for them to have the right systems in place to account for and disclose the climate impacts of their indirect support through financial intermediaries, as well as upstream advisory work that supports policies, institutions, and private-sector development. Aiming for 1.5⁰C. As more literature becomes available on pathways to limit temperature rise below 1.5⁰C, the MDBs and their shareholders would do well to follow these developments, as they will likely shift our understanding of how technologies align with achieving a low-carbon, sustainable future.